Does Half a Degree Matter? On July 1 NOAA’s National Climatic Data Center released the new U.S. Climate Normals based on 1981-2010 data. “Normals” are a 30-year average of daily and monthly temperatures, precipitation, snowfall, snow depth, and heating and cooling degree days. We hear them every day when the weather forecast is compared to normal and they’re used to forecast energy loads, crop planting times and construction schedules, to name a few. Every ten years NOAA recalculates the normals using an international protocol that drops the oldest decade and incorporates the most recent. On July 1, the 1970s were dropped and the 2000s included. The result shows that the average U.S. temperature increased half a degree. 2001-2010 was the hottest decade on record — 1.5oF hotter than the 1970s — but the normals are a three-decade average so it comes to 0.5oF. Surprisingly, most of the temperature gain was through warmer nights, not hotter days. January minimum temperatures rose 5 degrees in the most northern U.S. states. Does that half a degree matter? Indeed it does. Warmer nights mean that killing frosts start later in the fall and end earlier in the spring. Wherever you live, the growing season is a little bit longer. 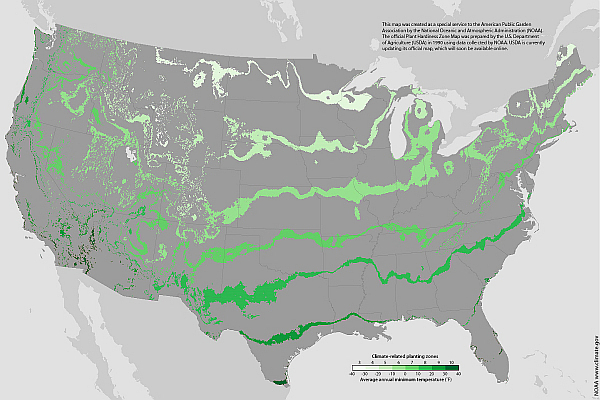 You can see this on the NOAA map above where each colored stripe represents the change in a plant hardiness zone. Pittsburgh is squarely inside Zone 6 so we aren’t in a colored stripe — yet — but northwestern Pennsylvania and the Allegheny Plateau have warmed enough to move from Zone 5 into 6. Michigan changed a lot! You might think this is great news but there are bad side effects. If you rely on plants at the southern edge of their range, those plants are stressed because it’s too hot for them. Even if you hate winter, you’ve got to admit it’s a great pest control system. Deep freezing nights protect our plants by killing many insect pests. Sadly, pine bark beetles now thrive in Colorado and Canada because their winters are no longer cold enough to kill them. If you’ve been gardening or farming for the past 30 years you’ve noticed the shift in temperature and you’ll be glad to know that USDA is revising their 1990 Plant Hardiness Map based on the new data. When the new map comes out, keep it handy — but expect to need a new one in only 10 years. 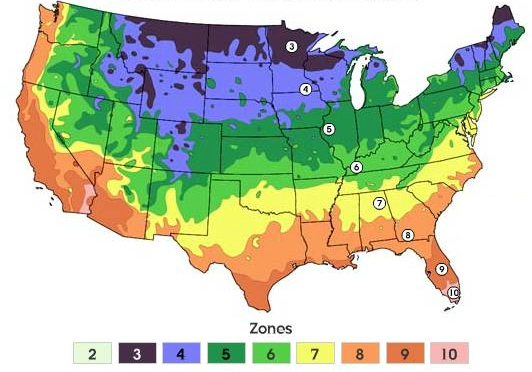 According to NOAA’s Climate Center, plant zones will shift dramatically by 2041. By then Pittsburgh will feel like Tennessee. We’ll be in Zone 7. Click on the map above to read Plants (and Pests) Respond to Warmer Nights and to see larger versions of the range maps. And some folks still don’t believe in global warming? Regardless of the cause(s), is there anything we can do at this point to mitigate the impacts? We could do something to mitigate the impacts… but it will take a huge amount of cooperation (which humans are not good at) to overcome our inertia and short-sightedness. Everyone believes that the earth’s temperature changes, It’s completely natural. The evidence that it’s cause is man-made is rather sketchy and often falsified by scientists looking for more funding. Even the greenest technology has a negligible affect on reducing global warming and a large negative affect on the economy and our Federal government’s budget, especially considering that China produces far more CO2 than the United states, not to mention other developing countries. Ecological hypes and scares have come and gone, and I believe that the global warming scare could be on it’s way out. As far as Kristen’s noticing local temperature changes, I know that the winters here in PA for the last couple years have been rather harsh. I may be in the minority, but I think I know a lot more chemistry than most people and have certainly researched this topic more than most people. Remember, not to long ago people thought that the world was going to end via Global cooling. People just don’t realize that nature is not a fragile as we think and is created with checks and balances. That’s the only reason it’s been able to last for so long. No matter what the cause, the earth’s climate is changing rapidly. Two indications are severe weather (extremes of hot, cold, wet & dry including heavy snow in PA) and the melting Arctic. Regardless of whose “fault” this is, humans stand a lot to lose. We currently live where conditions are right for us to thrive (fertile soil, adequate rainfall, and not underwater). Those conditions will be quite different in 100-200 years. Some places will become deserts, others will be underwater. Where things get bad, humans will have to move. This is already happening as the desert advances in sub-Sahara Africa. Eventually it will happen here. When the ocean rises coastal, Florida will be abandoned. The Netherlands understands this. Nature is not as fragile as we think but humans are far more fragile than we want to believe. This year the human population will reach 7 billion; by 2050 it will be 9 billion. With this many people on earth we’ll need lots more food and clean water than we already have but climate change will make this extra challenging because it will cause the loss of arable land to deserts and ocean flooding. There will be massive weather-related crop failures while we humans learn that the climate has become wrong for the plants we used to grow. Nature has checks and balances. Famine is one of them. We humans have got to figure this out or there will be a massive human die-off. Extinction. Not now. Later. Have humans contributed to climate change? I say yes, Josh says no. But it doesn’t matter about the past and who did what. What matters is this: Things are going to get much worse for humans (and most everything) on this planet. Is there something — anything — we can do now to mitigate the outcomes that our great and great-great grandchildren will face in the 22nd century? Yes, there are. We can start them now, however small their contribution, or we can lose precious time while we argue about it. I don’t know about the rest of you but I’m willing to try to avert the worst of the disaster. If we don’t even try, it will serve us right when humans go extinct. When I say that nature is not fragile, I mean that it will maintain sustainable conditions. NOAA’s predictions are based on the idea that humans are the main contributer and that there are no checks and balances in nature. As to what we can do, I don’t believe that the entire human race has any more ability to cool the earth as it does to warm it. Finally, I believe that more people will die because of efforts to stop global warming than will be saved. For instance, we are using food to fuel, in a world where world food prices are skyrocketing and world hunger is as much of a problem as ever, if not more. In a fragile world economy like we have today, it is a very serious thing to burden the economy with green favorites like cap and trade, especially since it looks like the world is going to get colder soon anyway judging from global climate cycles. The future of warming is not, as some would like to think, definitely one of a warming climate. To say that it is so is to have a biased or uninformed view. As for the fact that global warming causes extremes, I think that’s kind of silly. It seems rather unscrupulous to say that Global Warming causes drouths and floods, warm and cold, and then say that whenever something extreme happens it’s evidence for global warming. What could you possibly imagine that isn’t evidence for Global Warming by this definition? I’m sorry to say that the weather is not going to be exactly how you like it or how you think it should be Global Warming or not. I understand that I haven’t had time to offer much evidence for my arguments here and that I probably haven’t caused anyone to think more about the problem, but I’d like to thank Kate for allowing this exchange anyway. Please understand that I know that this issue is very complicated and that it is extremely easy to just take NOAA’s word for it, but I’d just like people to know that there is serious reason for doubt in this area and that the only people who benefit from forcing people to use green technology are the politicians, who gain even more power over the details of our lives through the alleged looming catastrophe. If you want to be green, I’m very happy for you, but forcing others to comply to their own detriment doesn’t seem very fair, or constitutional. I just really don’t want to fight natural cycles with my hard earned money. In the map above, NOAA is merely doing a statistical analysis of the existing conditions, not a prediction. The map shows the past 30 years. I’m the one who mentioned predictions. There is solid scientific data that has been collected over the last 100+ years that shows an overall warming trend globally. Predictions set aside, that is fact not fiction – there is a warming trend. To deny that seems really silly. I think people get confused by local weather conditions vs. climate trends. The level of carbon dioxide in our atmosphere has also risen. Yes there are natural causes, but it would be hard to deny that industrial activity and other human activities (e.g clearing of large expanses of forest in response to the needs of our growing population) play some role in the increase of CO2. There is a correlation between CO2 level and the rise in global temperature, not just now but over geologic time. We can sit back and do nothing to mitigate our contribution to CO2 production, and even deny that there is global warming in spite of proof positive that it’s happening, but I personally am not willing to gamble on the future of mankind. Kate – Thank you so much for posting this and for allowing both sides of the debate to be expressed. I personally, agree with you and Mark. We are a part of the Earth and her cycles, so we have contributed to what is happening and Nature will adjust and we will starve and die down. That is the cycle of life. It’s happened in history at a smaller scale, before. Cultures wore down the land and it couldn’t sustain feeding them – so they moved to other areas or died off. What most people seem to negate is that the Earth will continue to exist, with or without us. What is at stake is whether Earth will continue to support human life the way it has currently does. In my mind, it won’t. It can’t. We take more than we give back. It can be daunting, to think what one person can do to make a difference. Your post about this, is a perfect example of what can be done. Opening a dialogue, even if people see the science from two different perspectives, leads to awareness and eventual action. THANK YOU!! I’m sorry, I wanted to end this discussion here, but I felt I needed to clarify my statements after Mark’s post. I do not deny that the surface of the earth has gone through a period of warming. Any fool knows that. What some people either don’t know/ conveniently forget/ don’t care about is that the earth has been warming and cooling long before man even existed. Furthermore, the global temperatures of the last few decades are not record highs, meaning that the mere fact that man has increased the concentration of CO2 in the atmosphere does not prove that he is the driving factor. Such a conclusion would be completely illogical. Whether man has, in fact, SIGNIFICANTLY changed the concentration is debatable and the evidence is not as strong as some would like to think. Ice-core sampling, the most prevalent source of atmospheric concentrations of CO2 in the distant past is potentially inaccurate and severely flawed according to the website I gave the link to. I will leave it at that, since I am not qualified to debate on this level and let you read the article. If you really want the truth, I suggest you research this topic with an opened mind, you will definitely see climate change in a new way, even if it doesn’t change your opinion overall. Finally, I will end with my most important point. PLEASE READ THIS BEFORE YOU ANSWER ME. I CAN’T DEBATE WITH YOU IF YOU DON’T LISTEN CAREFULLY TO WHAT I SAY. I do believe that the earth has been getting warmer lately. I don’t believe that man is the cause. The corollary between atmospheric CO2 concentrations and global temperatures is extremely weak at best. There are other corollaries, such as sunspot activities that are much more persuasive. Not all scientists agree on this issue. My Grandfather is a PhD chemist and he is an adamant sceptic. Even if CO2 was a significant contributer, which I strongly believe it is not, man’s actual contribution is not that significant to the overall atmospheric concentrations of CO2. Although I respect people who believe otherwise, I take every opportunity I can to portray the other side of the argument, which has been quashed by the media and biased government funding. By the way, I’m sorry about my confusion over NOAA. The bottom line is that NOAA is biased and even if they don’t make such predictions they certainly are pushing the pitch rather hard. I read an interesting article last month that said that during discussions of hot topics (such as climate change) people with opposing viewpoints never convince each other to change their minds. Instead, the longer the discussion goes on the more entrenched opinions become despite evidence to the contrary. Polarization occurs on both sides. More evidence does not change minds. Mountain pine beetles (one type of bark beetle) are a problem I’ve heard a lot about from my friend who does fish and wildlife work in the west. A few years back we took a trip to Glacier National Park and contacted rangers ahead of time to get information on which trails to take to find whitebark pine trees. Whitebark pine grows specifically at high elevation and as temperatures rise, the beetles survive at higher and higher elevations and the whitebark pines are more and more prone to infestation. Whitebark pines are under several other pressures such as fire management in western forest stands and spreading blister rust. So there are a whole barrage of issues, but the higher temperatures changing the beetle ecology is just another problem for nifty trees. And as an example of how these minor changes can cause a cascade of effects and quickly cause problems for humans – the whitebark pine is a favorite of grizzly bears for their nuts which are especially nutritious. As the pines decline, mother grizzlies will bring their cubs to lower and lower elevations in search of food, and a hungry grizzly, especially one with cubs, doesn’t make for a good neighbor! But it all started with the beetles way up top.